CHECK JANUARY 2013 BLOG ENTRY FOR THE BISCUIT TIN METHOD TO MAKE BIOCHAR. Dolph In Australia uses the Moxham to make biochar. 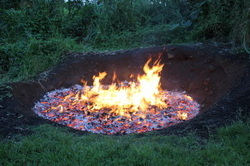 Pit method used to make biochar. Fom Blue Skys Cone Kiln- technique used in Japan for years. Another method that doesnt require special equipment,but I think if one had that type of timber (cut to length) it would be better used in the stove! Now this a situation that most people will come across, you have waste wood( branches and the likes) and how to burn them efficiently without lots of smoke and end up with biochar! Maybe an approach for thoese clearing Rhododendron?